Two weeks ago I was on Lesvos again along with Nikos once more. As I prepared my things, I had mixed feelings about the trip. On the one hand I wanted to go and see for myself what was happening there once more and try as best as I could to convey the scale of the problem to the outside world. On the other hand I was dreading it. These trips are starting to feel to me like little tastes of a war zone. When I leave them and come back to ‘civilian life’ they leave me feeling disjointed for a while. I want the trip to be worth it, not in monetary terms, but in terms of encapsulating everything I see and conveying it to the reader in the small word count I have to work with. I want it to be worth it because I’ve spent days helping my older son memorise lines for an ‘Ochi Day’ play, which I’m going to miss. I want to tell a story that’s been retold so many times already in a distinct way. The story starts before we even land. The east coast of Lesvos is coloured orange, and as we come in to land we turn and swoop over the tiny figures of newly arrived refugees standing on the shore and casting their long shadows in the morning light. 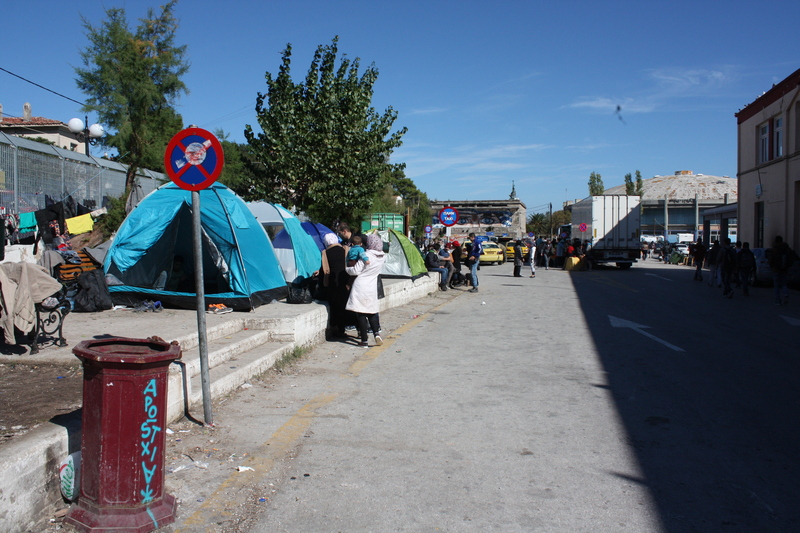 Driving into Mytilene the first thing that strikes me is that the tent city has started to return in the port. It wasn’t like that in September when I last visited, immediately after the violent clashes that took place between irate refugees fed up at being stuck on the island due to the slow registration process and riot police. Then, some locals had told me that the clean up was only for the benefit of upcoming elections. I’m starting to feel they might have been right. At the same time, I’m starting to realise that the comparatively orderly conditions of early September were the anomaly, and not what I’m seeing now. At the mayor’s office, the mayor of Mytilene, Spyros Galinos emerges from one media interview to see to his usual business of dealing with the refugee crisis. I shake hands with him briefly before he leaves again and his Press Officer, Marios Andriotis sits down to talk to me. He looks calmer this time. In September when I interviewed him, he looked at his wit’s end, fed up and making a superhuman effort not to lash out at the central government and European authorities at leaving Lesvos almost completely alone in dealing with this problem. He describes the fact that there are two new reception centers in Sikaminias and Mandamados, and that the registration centre at Kara Tepe has been reopened. It’s easy to forget how little this island has to work with. No matter what they do, it’s not enough, and when I visit Moria camp the next day, all I can do is walk around in a daze at the conditions. 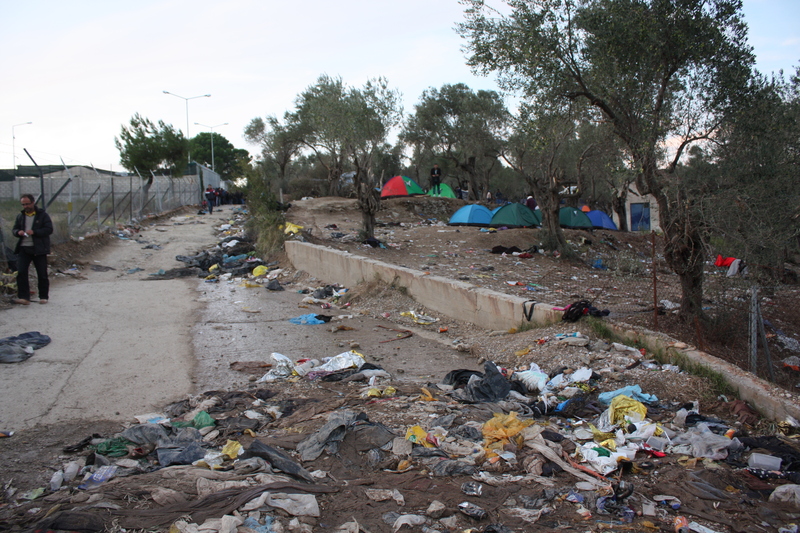 Lesvos should not have been left to deal with this alone, but it has. He answers immediately and without hesitation. “We have nothing to fear from them. We’re trying to find humanitarian way to deal with this and if we had more to offer we would. We’re also preparing a second proposal for a self sustaining approach. We want to give these people the chance to work while they’re on the island. And if they want, they can request asylum on Lesvos. We wind up and head off to get permission to go to the island’s cemetery, which we’d heard was running out of space. We find the office we need tucked away behind a church nearby. Up the stairs and down a small corridor, we make our case in the warm office that deals with burying those who died trying to reach a new life. IDs are photocopied, questions are asked and finally we have a piece of paper in our hands with the all-important round blue stamp on it. Later that afternoon, we set out for the cemetery. 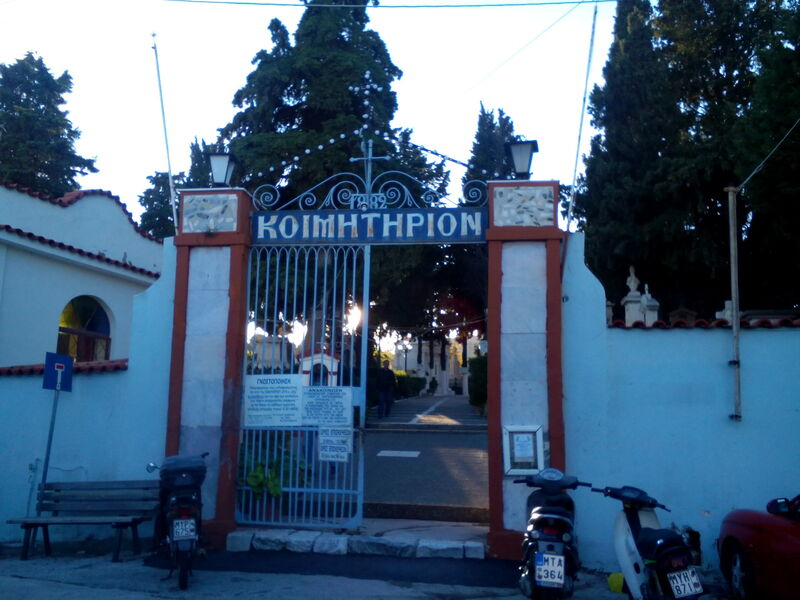 Mytilene’s Aghios Panteleimonas cemetery is the largest on the island. It holds some 6,000 plots. The site is peaceful – gentle breeze is blowing and the late afternoon sun is low in the sky. When I listen back to my recording I can hear birds chirping in the background. I stop to buy ten white carnations from the flower shop outside the cemetery and me and Nikos go to find Christos Mavraheilis, the head of the cemetery. He appears and directs us to his small, dark office. “Do you have a permit?” he asks and I hand over the piece of paper to him. We start walking up the hill towards the back of the cemetery. Mr. Christos tells me that there are three levels of grave, A, B and C. The finest ones are towards the bottom, the cheapest category lies towards the far end of the cemetery. The graves we walk past are clad in white marble and carefully kept. We keep on walking and come to an open space at the back. Here, right at the back next to a mud-splattered digger and small piles of rubbish are the graves of refugees, most of them unknown. 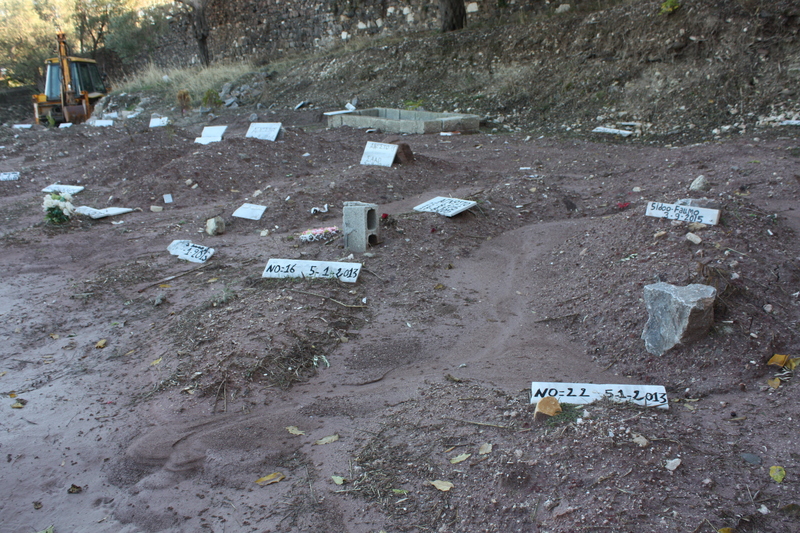 Some graves go back as far as 2007. The graves are no more than mounds of earth with broken pieces of marble serving as headstones. They carry words such as “unkown minor” or “unknown Afghan.” It’s difficult to walk through them – the recent heavy rain has created patches of thick mud, buried the makeshift marble headstones and flattened other graves. Me and Nikos try to pick our way through them directed by Mr Christos “Don’t step there! You’re standing on someone right now.” he shouts. We both jump back. “We’re not running out of space, we’re already completely out of space.” Mr Christos. explained. A local church’s philanthropic organization undertakes the process of the burials. DNA samples are taken at the hospital in the hopes of one day finding relatives. He points to a grave “This was an Iraqi identified a few days ago. His body has been sent back, and straight away another one was buried here.” Several identified bodies are awaiting repatriation. There is already a backlog of bodies waiting to take their place. 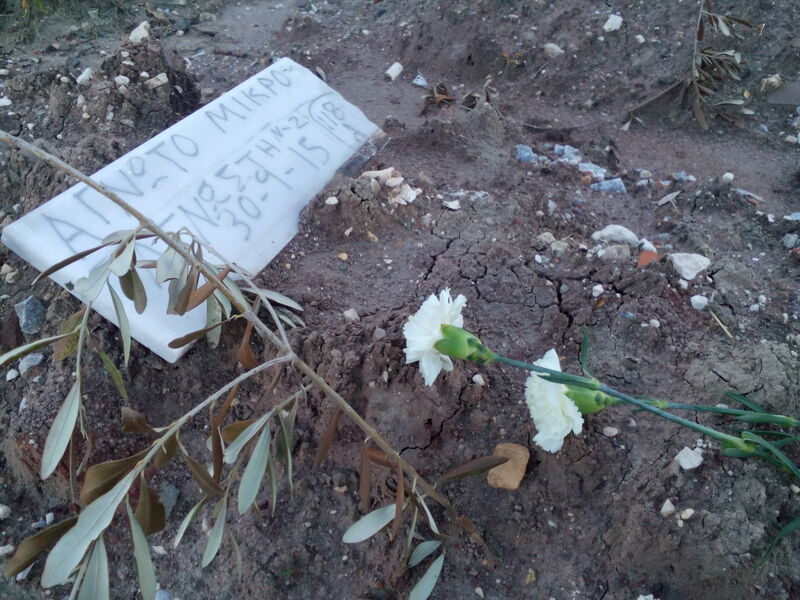 The grave of an unidentified refugee child buried along with a young woman. I remove the foil from the stems of my flowers and start laying them on the graves. “Leave them for the children” he says “I’ll show you where they are.” I leave flowers for the unknown boy buried with the woman, an unknown one year old, one more baby nearby. Soon my ten carnations are gone, left to join the remnants of a few dried flowers and olive branches that others have pressed into the graves. My offering feels pathetic. 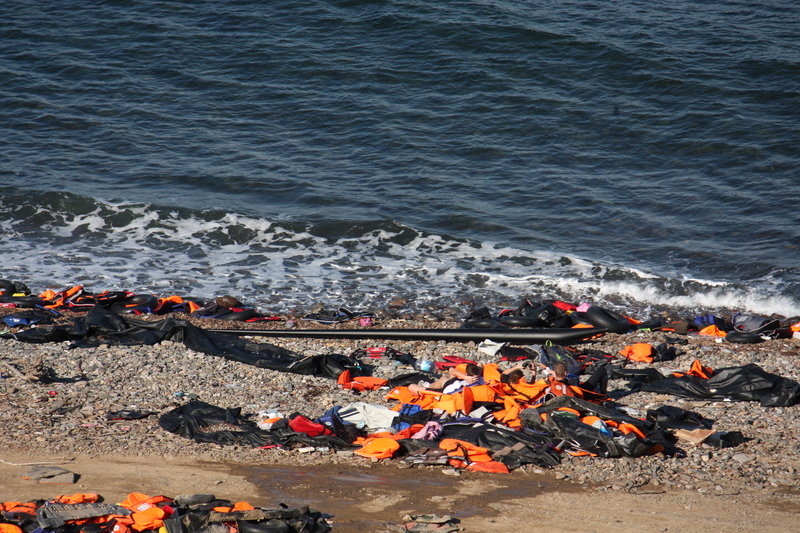 The previous day 13 more had drowned off the coast of Lesvos. Mr Christos has nowhere to put them. I can see for myself that there is absolutely no more space. As we walk back to the exit, I sigh heavily and Mr Christos asks me what’s wrong. “It’s upsetting.” I reply. “You should not let it upset you. You should draw strength from this. This is where you really see who we are, or rather what we are. None of us get to take anything with us when we go.” What he means is illustrated at your feet. Bone fragments and pieces of skull poke out here and there at the refugee grave sites. Mr Christos tells me they’re old bones, nothing to do with the current people buried beneath the ground. We walk some more, talking about our lives and families. He says he’s originally from Agiaso, a village on the island where many refugees from the 1922 Smyrna disaster ended up, my husband’s great grandparents included. “Do you want to see my babies?” he asks, and calls out to three dogs frolicking amid the graves. A while earlier, he had had to shoo them away at the request of some older ladies tending to graves. We leave in the early evening light and head to Molyvos, taking the dirt road via Skala Sikamineas. As we drive along the dark road, I’m looking for another journalist who I know is somewhere here. I see two vehicles that have stopped on the shore. They turn out to be locals who decided to come and watch the shore because the waves were high and no one else seemed to be there in case a boat came in. Further along, I see a woman on the shore working in the headlights of her car. “Are you Daphne?” I ask. “No, I’m Cheryl.” she says, smiling brightly. She has short curly hair, half of which is dyed turqouise. She tells me she is a volunteer due to leave soon and has come to the shore to look for things that could be turned into the jewellery she sells to help other volunteers fund their trips to Lesvos. It’s pitch black apart from the lights of our car and my mind plays strange tricks on me to try and explain what I’m seeing. We pass several large wooden boats leaning on the beaches which I didn’t see in September. “Are these Turkish wooden boats that bring people over?” Nikos asks. I start to answer that they’re not, these are just normal fishing boats, and as I talk I can feel the words fall away because the boats are tethered too close to the shore, lying on their sides. Their windows are broken and the names on the sides of them are not Greek. The rickety wooden boats are a recent development. Not long after my trip, one of them falls apart with disastrous consequences. As we rumble around tight corners, out on the darkened beaches the reflective bands from hundreds and thousands of life jackets discarded on the beach shine back at us like the eyes of strange creatures crouching on the shoreline. Discarded emergency blankets are everywhere, left on the shore, tangled in bushes and tree branches. Some of them have been worn away by months of exposure into golden flecks peppering the roadside like confetti, except there is nothing at all to celebrate here. It’s incredibly eerie. Nikos tries to film, but the recent rain has ruined the road. It’s impossible to drive without hitting potholes. A piece of what is some sort of ID which I found down a cliff in Skala Sikamnias. 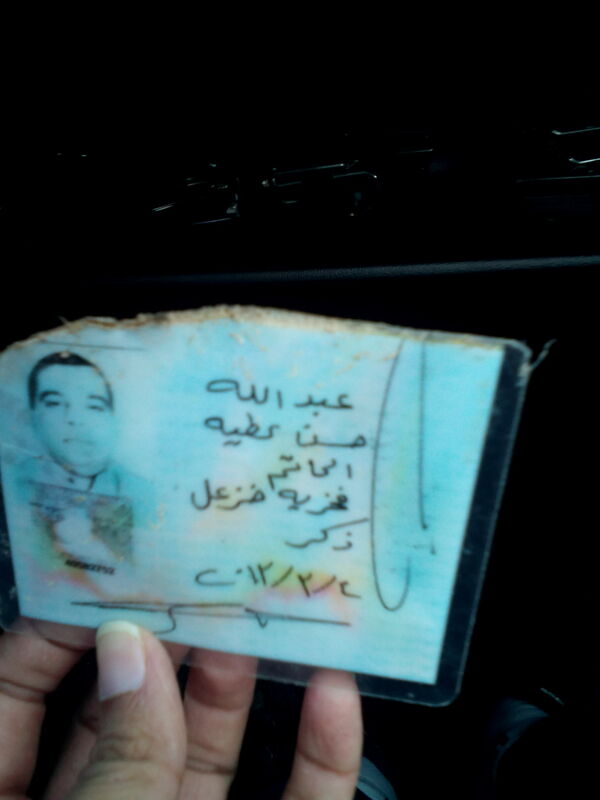 Arab speaking friends couldn’t conclude exactly what this was. On Molyvos harbour, the scene shocks me because I didn’t see it in September. People are sleeping everywhere on the harbour. Parents walk around with children that are crying. Me and Nikos sit down to eat and I feel crestfallen. I don’t know how to express what I feel – since becoming a mother I want to believe the world is a good place. It’s nearly impossible to hold on to that when I’m looking right at the consequences of humanity’s ugliness. I have an espresso to wake myself up and we head back to Efthalou. At the house of Eric and Philippa Kempson, donations are sorted and arranged for when they are needed. Some Dutch volunteer doctors in wetsuits arrive asking for blankets for 30 people – all the camps are full and the people will be sleeping in a church that night. Down the road we find Eric and Philippa Kempson taking a rare break at a tavern close to their house. We chat for a while and I think about something I had read which said when you see terrible things happening in the world, look for someone who is helping. There’s always someone who is helping. In Lesvos’ case, it’s Eric and Philippa. I don’t have space in the article I finally write to recount their experiences of incredibly aggressive photographers from large, reputable news agencies who have threatened them and other volunteers both physically and verbally, in one instance slapping a female volunteer in the face. Eric tells me about a difficult boat landing at the foot of high cliffs on a beach that was very hard to access. While he and other volunteers tried to get the refugees off the boat and to safety, photographers perched on the top of the cliff yelled at the refugees to climb in their direction and reached out their hands as if to help them. Not knowing any better, the people began to climb and the photographers clicked away as they tried to scramble up the sheer, crumbling cliff face. It was terrifying as Eric and the others screamed at them to stop climbing. Everyone eventually got off the beach safely, but tempers were high and nerves were shred. “We started telling people planning to head to Macedonia to arm themselves with sticks and move their groups with women and children in the centre, men on the outside.” I feel like I’ve been punched in the stomach when he tells me this. I stare into my coffee cup. The refugee crisis seems to have no limit when it comes to awful stories and the complete cruelty of humans to each other. The next day we head back to Efthalou and along the way people are sleeping on the road. They are so exhausted they are just lying on bends in the road with their heads on backpacks, arms tucked against themselves and legs curled, asleep and not caring about the cars that are zooming past their heads. I want to give a hand as boats arrive so I change into a wetsuit. As I approach the beach, a boat is just landing so I jump out of the car, but in the end I just find myself getting in the way. I step back. Someone is screaming “Whose white car is this, move this car right now!” The mood is chaotic, several small NGOs have stopped in their vans and a large bus to transport the refugees is trying to maneuver near my car. “OK! Calm down!” I shout at the man shouting at me. These smaller NGOs are all over the place, creating a disjointed mish-mash of approaches. Once the refugees are gone, local scavengers move in and with surgical precision they neatly slice the boat up into its various components, pack it up, and drive it away. I watch this happening while I chat to the German volunteer who had been yelling at me moments before. I can’t blame him considering the problems media personnel have caused for their work. Then I put on my diving gear and head into the sea. I had a thought that there was a whole other story to be told under the sea of lost belongings, discarded papers and more. I had convinced myself of this to the point where I was wondering how to carry the things I’d find while I was diving. But I find nothing apart from a knife which I can’t find again when I go back for it. Nikos films his shots as I sit on the beach wondering where to take the story next. This in my mind had been a central point in my article, and it didn’t deliver. Back to the drawing board. We’re heading back on the dirt road when I realise a boat we’ve been watching is going to land within moments. I go down to the beach but I keep my distance this time. The boat inches closer to shore. Volunteers wave it in with life jackets on sticks. During the final few meters, the people on the boat finally realise they’re safe and throw their inflatable rings into the sea. They clap and cheer. Half a dozen photographers and cameramen on the shore are delighted. When I see small children the age of my own sons being carefully passed along the boat to volunteers on the beach, tiny hands clenched in fear, it suddenly becomes too much and I can’t watch any more. When I took this picture I didn’t even see the volunteers resting against the piles of life jackets as they watched out for new boats. We roll down the road past Skala Sikamineas camp and I suddenly see something and ask Nikos to stop. I backtrack and find two ladies sitting on a bench, watching the sea. 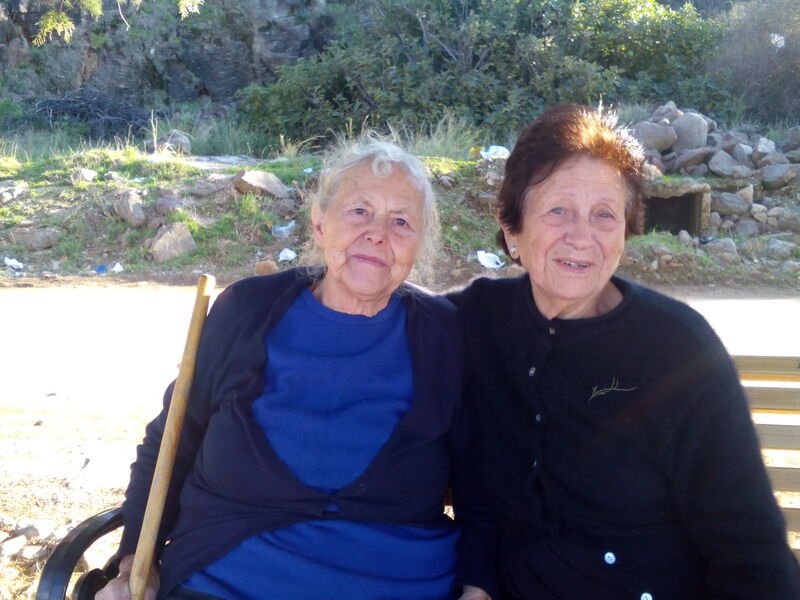 The older of the two is one of three old ladies who were pictured caring for a refugee baby. The photograph went viral, turning them into a symbol of kindness in the face of misery. I explain what I’m doing and ask them if they’ll tell me about the photo. Marissa Mavrapidou – “Maria, but everyone calls me Marissa” – 83, was one of the women in the photo. “That day, the mother had just arrived and was soaked. She had a tiny baby about six weeks old. Well, we couldn’t talk to her, so through signs and gestures we told her to leave the baby with us and get changed. “The baby was fussy so we explained to the mother to get a bottle of warm milk. But he wouldn’t drink it, so I put it against my cheek and told the mother to run it under a tap to cool it. Again, through gestures because we couldn’t talk to her. When it was ready, he drank it all up. Our final stop for the day is Moria camp. This is the central registration point mainly for non Syrians. The conditions are abysmal. Flimsy tents radiate out in every direction from the fenced-off registration center and the air is thick with the rancid smoke from fires lit from pieces of wood and plastic, their flames jumping in alarming proximity to the tents. 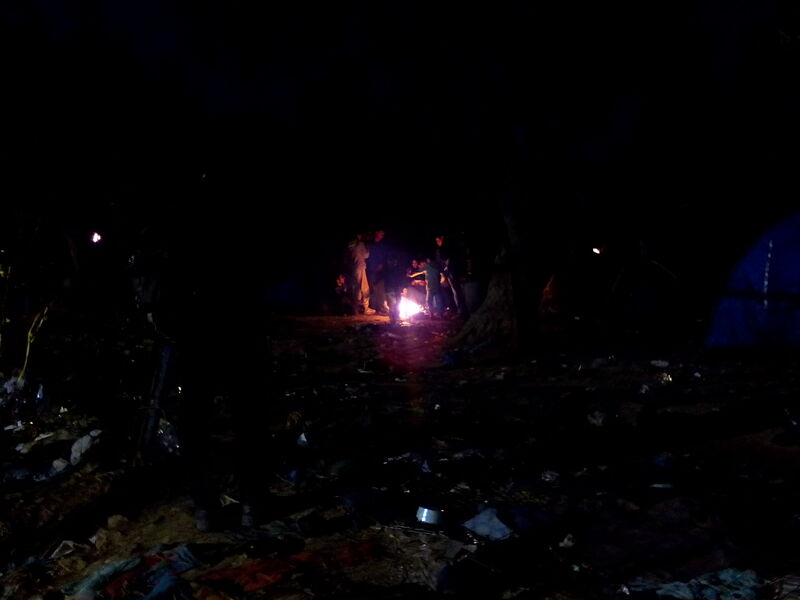 I pick my way through piles of rubbish with rivulets of water flowing through them around the perimeter of the camp as the light fades. A woman speaking Farsi walks hand in hand with a man. When she sees my camera, she turns away angrily, her hand to her face. She talks to the man as she faces away, clearly fed up and upset. He tries to coax her and pulls on her hand to keep walking. I put my camera away and try to indicate I didn’t take any pictures. People queue outside to be let into the central registration point. When the gates open, there is a crush to get inside and small children cry as tempers flare. Harried volunteers try to filter people towards dry clothes. “We have nothing else to give them right now,” said Susan Penninkhof of a recently formed Dutch NGO, Live for Lives as she tried to make herself understood. “Food?” a man asks “No food, no water.” she says, trying to direct him to a tap where a woman is scrubbing clothes. I see UNHCR plastic housing units with signs in three languages for people not to light fires near them. As darkness falls, the toxic fires are everywhere. People are trying to stay warm and it’s like an accident waiting to happen. The wind has whipped up and olive branches sway overhead as people continue to keep the fires with the rubbish around them. One spark, one sudden gust of wind – the consequences are too awful to think about. I walk past a tent and inside I can hear a child crying and a man talking to it in soothing tones, saying habibi. The camp is being extended and as I watch the builders work it strikes me that they’re using the same materials as what I’ve seen in television images of the Hungarian border being sealed. Europe is closing its borders. Lesvos is building camps. A beautiful full moon hung low in the sky as we left. Fires lit to keep warm, much too close to cheap tents. We make our flight with minutes to spare. I discover that I have to pay another EUR 35 to take my diving gear back in Athens and angrily pay. An expensive miscalculation on my part. My second trip to Lesvos comes to an end as the lights of the island twinkle in the black sea. At our hotel the previous night on a desolate beach in Skala Mistegna, the lights of Turkey looked crystal clear. I looked out of the window for a while, watching the waves and the lights. I wondered who was stood on the opposite shore looking back in my direction and trying to gather the courage to get onto a boat. The night was so clear I could see how easy it could be to convince yourself that it’s so close, just get on the boat, it’s just over there, we’ll make it, we’ll be safe. Europe is just over there, we can see it. Our dreams are there, a future is there, a place for our child to sleep without bombs falling, it’s all so close. Reach out and you can touch it. All you have to do is get on the boat. Just under 24 hours after I left the island, a wooden boat carrying several hundred people sank into the black sea off the coast of Lesvos. Some 38 people drowned. A journalist/volunteer present at the time wrote this incredible piece about being caught up in the incident. On the harbour of Molyvos where I’d had dinner two nights before, the dying were laid out and mothers screamed for their lost children. I read this news while I was another world away in the UK. Family life continued around me, and I felt distraught. I couldn’t read the article in one sitting. I searched around in myself to find something to comfort, some piece of information to contextualise this disaster. I found nothing. Lesvos has a special place in my heart. It’s the place where my husband and I revelled in the secret of the little life inside me on a summer holiday with friends. No one else knew except the two of us and the trees and rocks that eavesdropped on our conversations on solitary beaches. I swam the sea and walked the streets wondering about the soul I would bring into this world. A magical island, a tragic island. A place where death and life collide.